This is a great book!! Four-time US Champion Yasser Seirawan provides a fascinating and highly entertaining account of his games and encounters with the world champions of chess including Garry Kasparov, Anatoly Karpov, Bobby Fischer, Boris Spassky, Tigran Petrosian, Mikhail Tal, Vassily Smyslov, Mikhail Botvinnik and Max Euwe. Seriwan presents an in depth look at not only his wins, but his defeats and that's a rare thing among GMs writing books about their "best" games. His annotations are in plain language and they are first class. You can't help but improve by carefully playing through the games and reading his insights and seeing what he was thinking. Besides the games, there are stories and anecdotes galore. 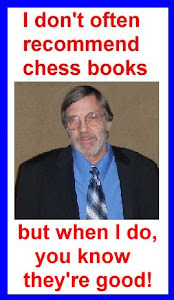 There is an extensive introduction and discussion of each opponent, chess politics and other events of the time are also given. Although he never played Bobby Fischer (that was a surprise to me! ), Seirawan includes a 13 pages of his views on Fischer that are simply fascinating. But wait! There's more! There are stories about Korchnoi, Reshevsky, Euwe, Larsen and others. Opinion: I don't like spending money for chess books because most of them never get really read, but this one did and it was worth the $30.